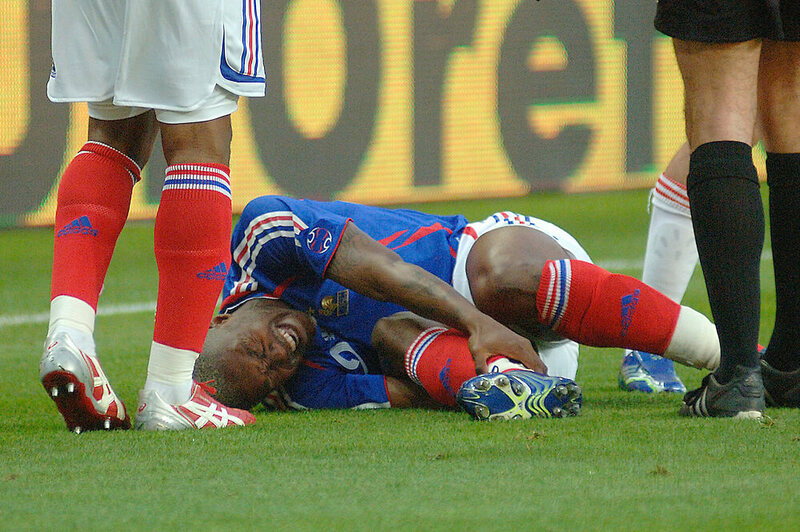 12 Most Horrific Football Injuries Ever. 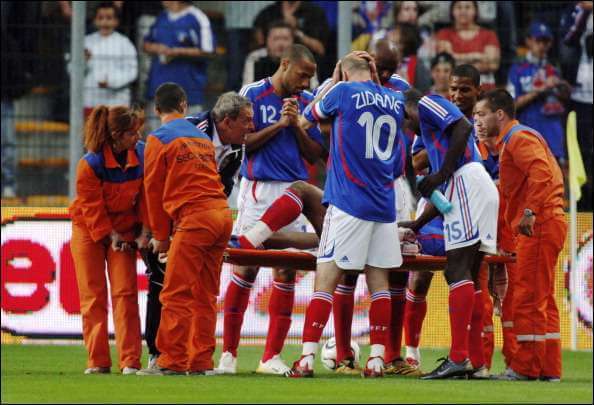 Football is a contact sports and as such, the players are always at a risk of injury. But sometimes, the injuries are so severe that careers and even lives are threatened. 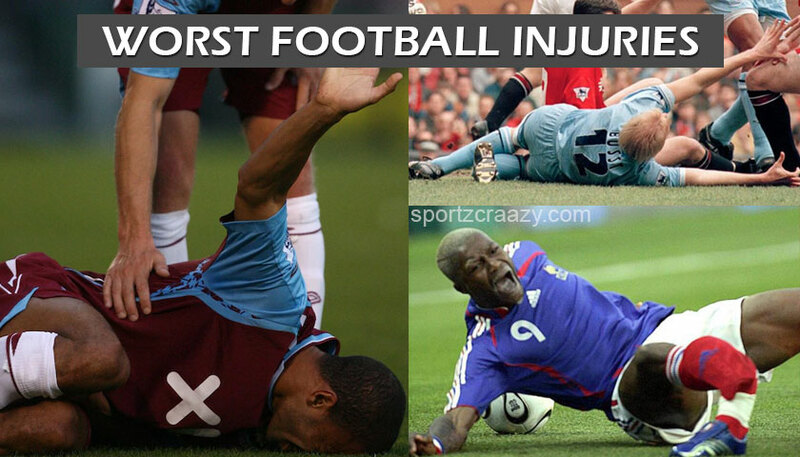 We look at a few of the Worst Football Injuries in this article. Manchester United was playing PSV in the group stages of the Champions League on 15th September, 2015. Young Luke Shaw, the teenage English Left Back sensation, was on the rise and on the way to fulfill his potential. 15 minutes into the game, Luke Shaw ran into the PSV box and looked clear on goal before Mexican Defender Hector Moreno tackled him, catching him in his standing leg while trying to poke the ball away. Shaw required medical attention for almost 10 minutes, as the Manchester United Medical team had to give him oxygen before carefully lifting him to the stretcher and taking him away. 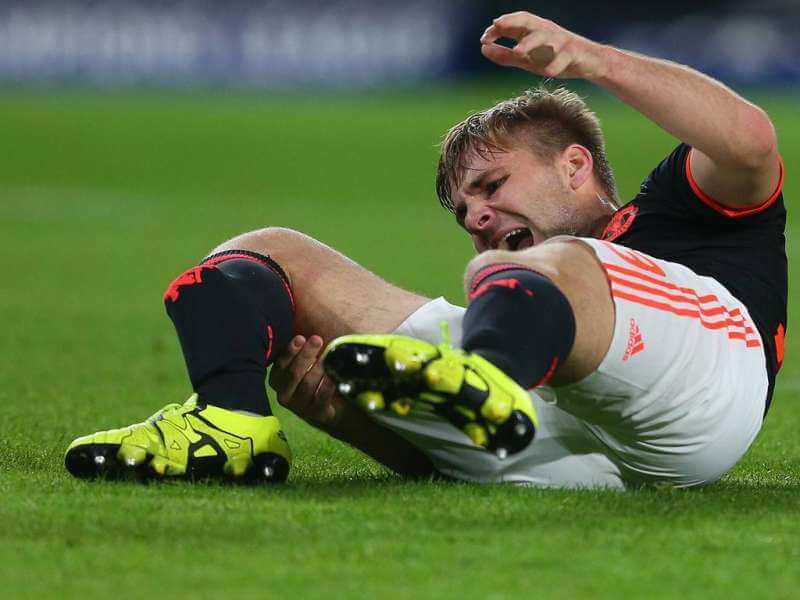 Shaw feared at that moment that he might never play soccer again. He would be out of action for 10 months and even though he still plays for Manchester United, he has been unable to reach the form prior to his injury. Alan Smith was playing for Manchester United against Liverpool in a fiercely contested tie on 18th February, 2006, when he broke his leg while attempting to block John Arne Riise’s hot. And then, as he landed awkwardly, he dislocated his ankle. It was a horrible thing to happen to a person on the field. In fact it was so severe that his manager, the Legendary Sir Alex Ferguson described it as the worst he had ever seen. Smith would ultimately be out for 7 months, before returning to action. Legendary Swedish striker Henrik Larsson was playing for Celtic when he suffered a devastating injury. On 22nd October 1999, as Celtic faced Lyon, Larsson faced a rough challenge from Lyon’s Serge Blanc. It caused a double fracture on his left leg. He was sidelined for 8 months and it was initially feared that he might retire, but Larsson returned better than ever, making his comeback as he featured in the last game of the 1999-2000 season. Djibril Cisse was a french footballer who was playing for Liverpool when the English Premier League side faced Blackburn Rovers on 30th October, 2004. Cisse somehow caught his foot in the turf, as he fell awkwardly and broke his shin in two places. He had just joined Liverpool 3 months ago. He mentioned later in an interview that had it not been for the immediate medical care he received at the stadium, he might have lost his leg. He was ruled out for 7 months, and returned at the end of the season. When Birmingham City’s Martin Taylor tackled Arsenal’s Eduardo da Silva during a match between the two English Clubs, the situation was so bad that the Arsenal player had to be treated on the ground for 8 minutes and Arsenal Manager Arsene Wenger had sensationally claimed that Taylor should never be allowed to play football again. 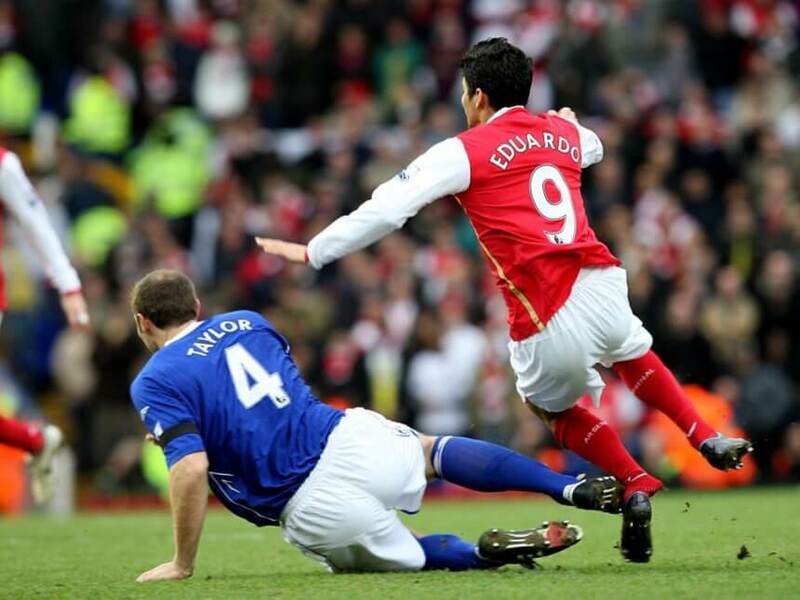 Eduardo had broken his left fibula and dislocated his left ankle, such was the recklessness of the tackle and he had to undergo immediate surgery. Even though it was initially feared that his career might be over, Eduardo did make a come back almost a year later, but was not the same player anymore. The Chelsea keeper was hit in the head by Reading’s Stephen Hunt, when the Irish midfielder kneed into his head. The injury was so critical that without immediate medical assistance, Peter Cech could have lost his life. He suffered heavy concussion and after initially looking okay, collapsed in the dressing room when he was carried away from the playing area. He was immediately shifted to the Royal Berkshire Hospital, as it was feared that he had suffered a blood clot. There, it was noted that there was a depressed fracture in his skull and he had to undergo an operation which saved his life. Cech returned to the first team after 3 months, but ever since has been playing with a protective covering on his head. Cisse is the only player to be named twice in this list. Two years after his double leg break, Cisse was preparing for the 2006 World Cup. He was playing in a warm up game against China, as a part of the preparations when his luck ran out again. During the game, he was lost his balance after a tussle with a defender and this time, twisted his right leg as he fell. His right leg broke above the ankle and caused an open fracture. 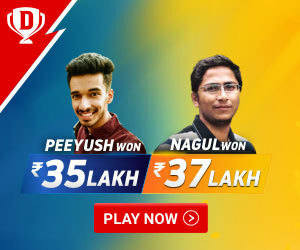 He was sadly ruled out for the world cup. However, in a repeat miracle, Cisse returned to action after 7 months, making a full recovery. 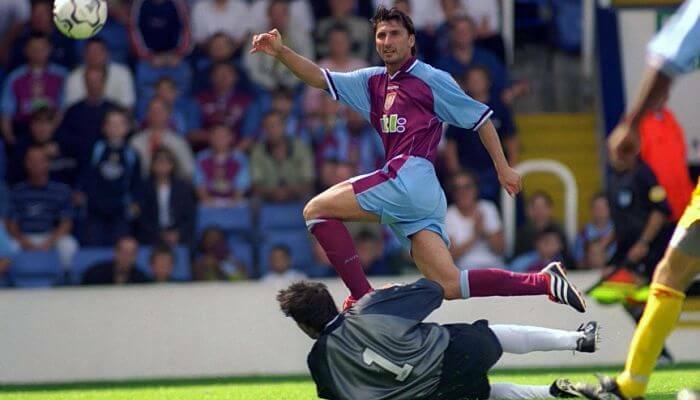 Beligan striker Luke Nilis joined Aston Villa from PSV Eindhoven on a free transfer in the 2000/01 season. He started brightly, scoring against Chelsea, but disaster struck him in only his third game for his new club. Aston Villa was playing Ipswich on 9th September 2000, when Nilis collided with Ipswich Goalkeeper Richard Wright. The collision was so rough that it cause a double fracture on his right leg. It would be the last time Nilis played for Aston Villa. The injury was so severe that 4 months later, Nilis would announce his retirement from Football. Alf Inge Haaland was playing for Leeds in a match against Manchester United, when he tackled Roy Keane so bad that the Irishman was ruled out for the season. They say revenge is a dish best served cold. Well, 4 years later, Haaland was playing for Manchester City in the Manchester Derby against Manchester United, when Roy Keane got his pay back. Keane aimed a knee high horror lunge that forced Haaland out of the game, out of the season and eventually, after a few failed comeback attempts, forced Haaland to retire. For his troubles, Roy Keane was shown a straight Red Card, handed a 5 game suspension and fined 150000 pounds. 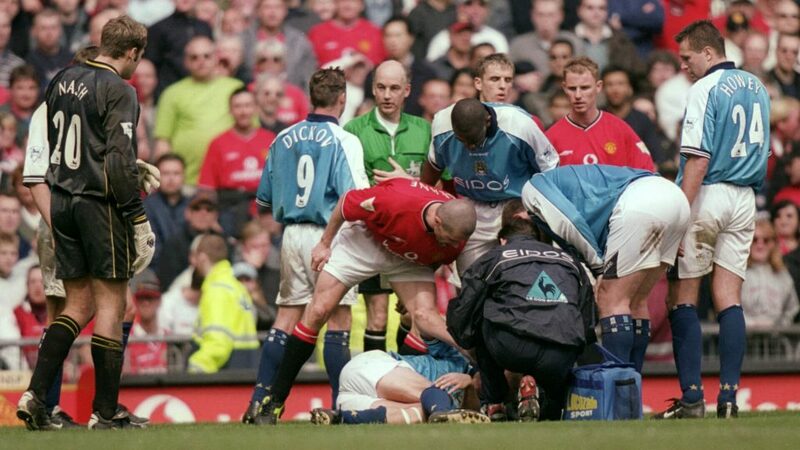 Keane admitted later that his tackle was a revenge for the injury Haaland cause him 4 years before. 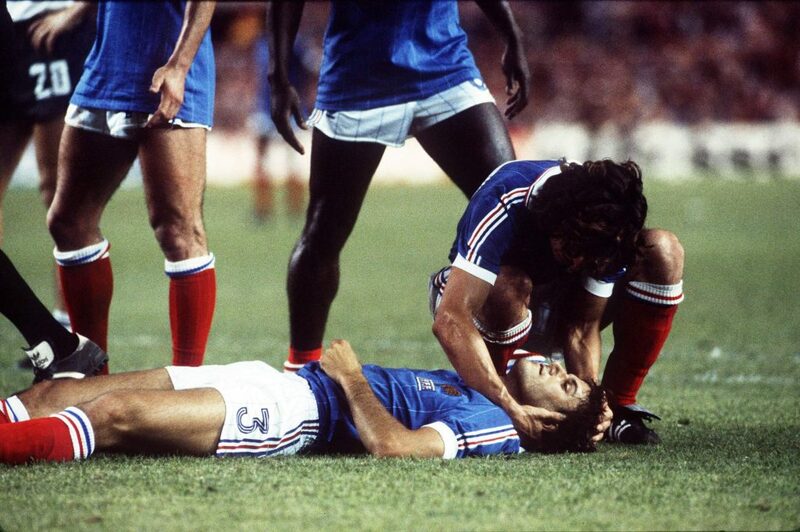 In the 1982 World Cup, France was playing West Germany on 8th July, 1982. France’s Patrick Battiston was clear on goal when West Germany Goalkeeper Harald Schumacher hit him in an attempt to stop him and resulted in the worst World Cup injury of all time. Even though it looked like he had hit Battiston with a flying kick, Schumacher strangely escaped without punishment. Battiston slipped into coma as a result of the collision. His vertebrae was damaged, his jaw was broken and he had also lost 4 teeth. His jaw had to be put back into place surgically and it took him five months to fully recover and return to action. Also Check: Top 10 Best Left Footed Players. 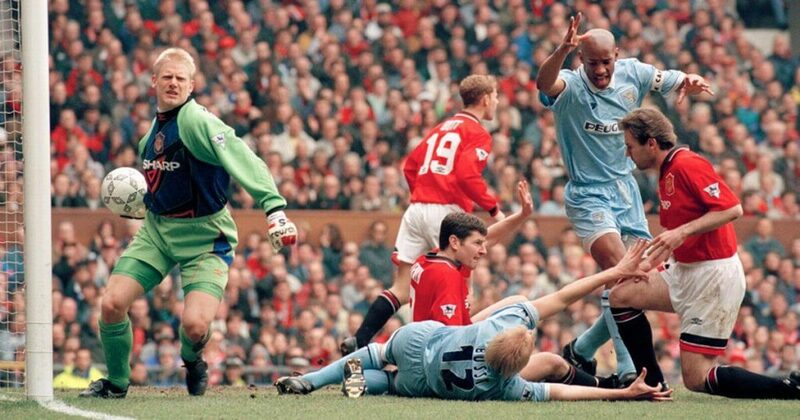 When David Busst of Coventry City collided with Denis Irwin of Manchester United on 8th April, 1996, Busst suffered a double fracture on his leg. It cause his fibula bone to crack and penetrate out of the skin, making it visible to players around. The match was stopped for 15 minutes and the blood had to be cleaned off the pitch. The live coverage cameras refrained from showing the image to the world, but the shock on Manchester United Goalkeeper Peter Schmeichel’s face can never be forgotten. Schmeichel vomited on the pitch and had to be counseled for many weeks to help him cope with the terrible image in his mind. To make matters worse, Busst contracted secondary infections at the hospital that further complicated the matters. He had to undergo approximately 26 operations and was extremely lucky that the Doctors could save his leg from amputation. He would never play again, but he was thankful that he could walk. 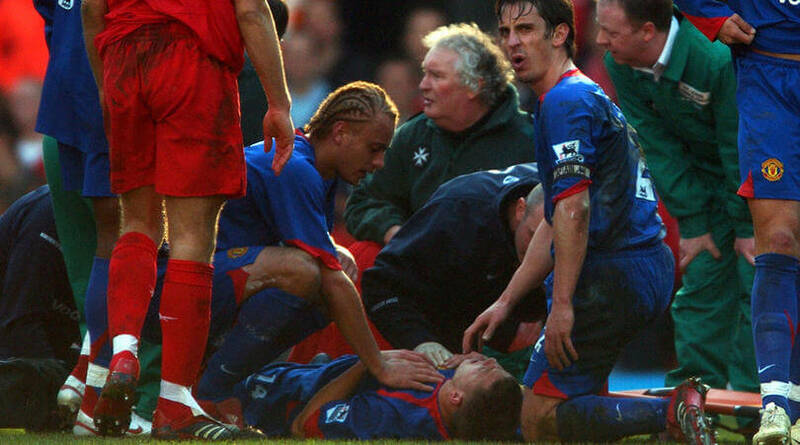 This was clearly the worst injury in the history of Football.